Monday – Friday mornings with reservations only. $8 (includes tax) per student, accompanying adults and siblings. Free admission for classroom teachers (paid school staff only). Up to 3-hour time slot available! We provide a covered picnic area (you bring food). There’s a minimum of 50 paid admissions required to schedule a field trip. One mini-pumpkin for each paid admission included. Learning on a Farm is Fun! 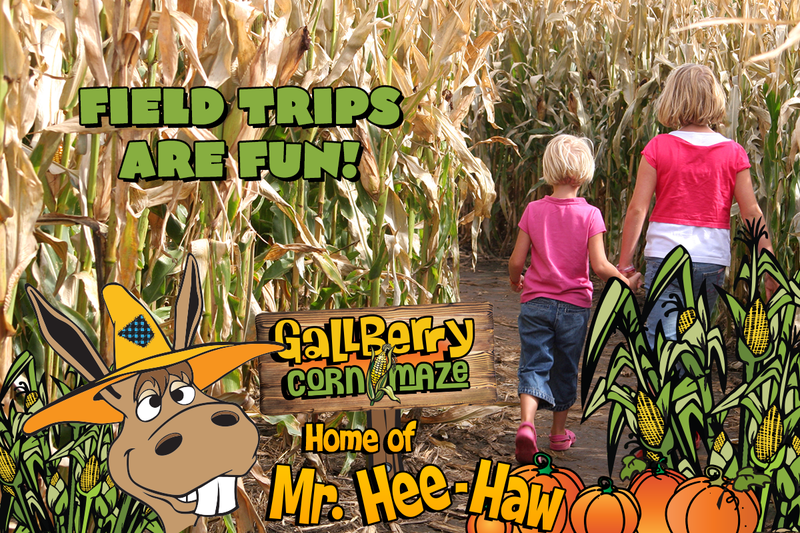 Your classroom(s) will be treated to a “free-range” learning experience at Gallberry Corn Maze! You may choose the activities that students can participate in and pace the visit according to your schedule. Everyone will enjoy a hayride together and a fun ride on our Blue Barrel Train! Other attractions include a giant Jumping Pillow, the Double Barrel Tube Slides, a giant Corn Shack, a Hay Mountain, Super Sandbox with diggers, Corn Hole games and more! Make time to explore our one-acre The Three Little Racing Pigs storybook themed maze for an exciting and interactive adventure. Visit our Spookley [the Square Pumpkin] Barn! Enjoy the playground set and more. Mr. Hee-Haw is a Hoot! Yes, you’ll be greeted by the farm’s precocious mascot, a donkey named Mr. Hee-Haw! Your students will love getting to know our friendly farm animals! We have peacocks, pigs, bunnies, chickens, and turkeys. Our clever goats even have their own Golden Goat Bridge!